Just in time for Halloween is a terrifying game for you to read about. It's spectacularly spooky! I shiver in my shoes just thinking about it. I'm just glad I didn't drink too much water or things might have gotten messy! 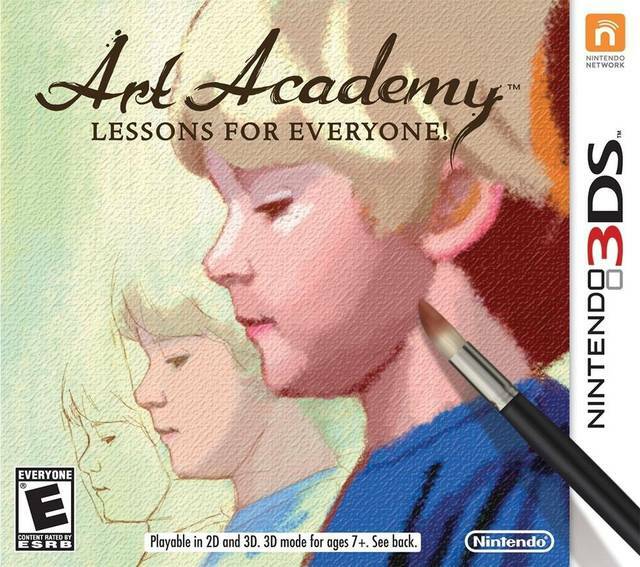 It's none other than... Art Academy: Lessons for Everyone! Jeepers creepers! Colors! 3D released on the Nintendo eShop earlier this year. You might be wondering to yourself what the point of purchasing a much more costlier art game is if you already have Colors! 3D in your digital 3DS collection. While that program is terrific for those who already know how to draw and do art, the subject of this review, Art Academy: Lessons for Everyone, contains more options and a greater focus on teaching even the most inept artiste among us how to create fantastic works of art. 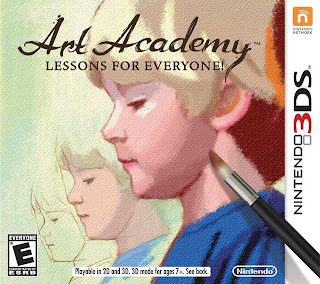 Art Academy: Lessons for Everyone has a pretty decent amount of content for its budget price. If you're feeling bold, you can right away start painting or drawing your own creative concoctions via the Free Paint mode. There you can choose your own canvas, what tools you wish to use (paints, pencils, or pastels), and whether or not you intend to use a picture for reference. 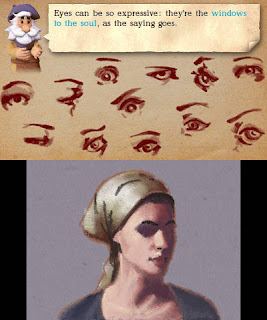 If you're like me, however, you may want to get a refresher course on how to create competent art through the game's many lessons. create with a variety of useful tools. There are two types of lessons within Art Academy, the Introductory Course and the Advanced Course. The Introductory lessons teach you how to do the absolute basic essentials of creating art, learning how to use paints, pencils, and pastels, and knowing a bit about shading techniques, highlights, and more; while the Advanced lessons go into more detail and talk about such concepts like perspective and how to do portraits. Each lesson is taught by the in-game teacher, Vince, and the lessons are divided up into multiple stages, some with multiple steps. 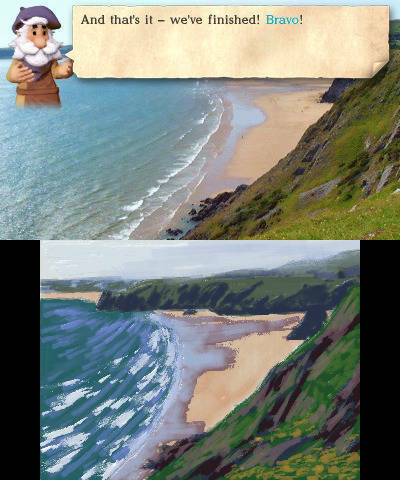 For instance, the first stage could be about simply creating the horizon line, while the next could be about sketching out the most basic elements of the picture. Final steps generally include adding in highlights and details to bring the most pizazz to your picture. The lessons not only help you with creating work within the game itself, but they assist in giving you real-world practice. Every lesson introduces a new concept to work with and try. Of course, there are obvious new concepts like using paint, pencils, colored pencils, and pastels, but there also concepts like hatching, blending, mixing paints, among many others. Your teacher Vince even throws in some art history to make Art Academy: Lessons for Everyone not just sharpen your artistic skill but your knowledge of art as well. The lessons perfectly throw in these little useful tidbits when the most opportune situation presents itself. are brought up by Vince constantly. When you begin Art Academy your available amount of lessons you can attempt is small. However, through completing lessons you unlock new ones. You also unlock mini-lessons, which the game gives you a quick rundown on how the finished piece was completed, and then gives you free reign to try the picture as you see fit. These mini-lessons basically put the skills you acquired in a main lesson to try out for yourself to create a picture with minimum help and just a teensy bit of guidance (i.e. what steps Vince went through to complete his painting or picture). Outside of the 20+ lessons available to players initially on the game card, you can download DLC lessons for $1.99 each. I sort of see that as too much for one lesson and not worth it when there are already enough lessons to go through on the game as is. And if you do decide to try out new lessons and still don't get that itch scratched for something new, you can download mini-lessons created by your 3DS friends, or even create your own. The user interface takes a little getting used to at first, but you can go on to share your own works of art while teaching your friends how you went about doing so. Speaking of sharing, finished works or works in progress can be saved to your SD card or passed along to your friends via SpotPass (perhaps share your work in Swapnote!). You can even marvel at your own creations by hanging them up along a virtual 3D gallery with numerous rooms to place your pictures, portraits, and paintings in. You can actually go so far as to hang them horizontally or vertically, as well as choose any frame you wish. See other works of mine here. 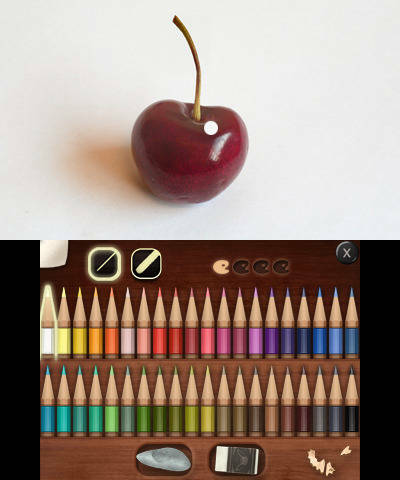 Creating a work of art in Art Academy: Lessons for Everyone is not as difficult as you might think. That is thanks in one part to the wonderful and helpful instructions and another part to the easy controls and tools given to you. For one, the grid tool puts a grid on both the upper screen where Vince's project is and the bottom screen which is where you do your work on. You can zoom in and out with ease to help create all the finer details necessary. Perhaps the only problems with the controls of Art Academy on 3DS are that there can be issues with the calibrating of the system's stylus as well as there being no quick undo option. I have had to redo whole sections of projects because my I unintentionally hit the touch screen with my pinky while drawing and thus a giant streak was created across my work. Very annoying. with a completed piece you can feel proud of. Art Academy: Lessons for Everyone is an incredibly rewarding title that might just shock you in giving you the revelation that you're not as bad an artist as you might have thought you were. And if you already are an expert, this 3DS version of Art Academy gives you an abundance of tools to create extraordinary works. It is not without its problems such as the constant need to have to calibrate the touch screen to make accurate marks, but the overall package is superb. Whether you're a tyro at art or a professional with years of experience, Art Academy: Lessons for Everyone is a worthwhile piece of software for, well, everyone!